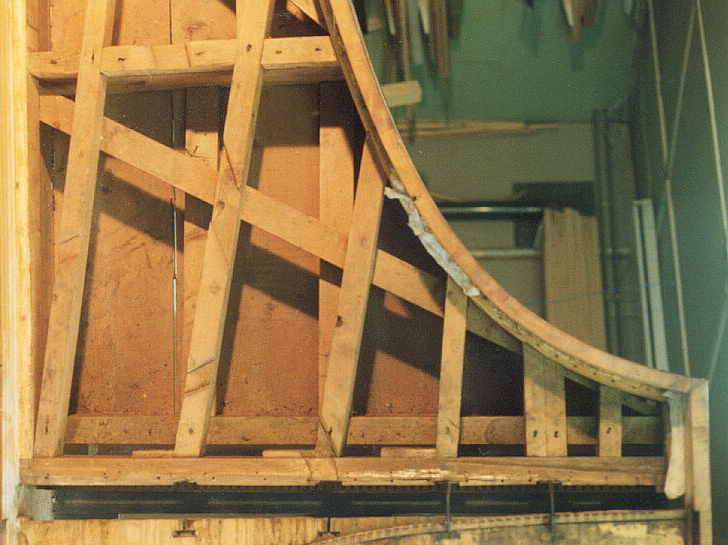 The object of this restoration was to bring back a totally unplayable and warped fortepiano to its original state, so that it could be used as a concert instrument again. Jorge Gil of ‘Em Orbita’, who recommended our firm for the restoration, was very clear about this. This type of Clementi, probably dating from before 1805, is relatively rare. From Martha Novak Clinckscales’ Book ‘Makers of the Piano’ 1700-1820, it appears that about 14 Clementi ‘Grand Pianos’ have survived, nr. 14 possibly being the Queluz’ instrument, since the description calls it early 19th. century and the present owner is supposed to be the ‘Museu Federico the Freitas’ in Madeira. I suppose that it was acquired from this museum by the Palacio de Queluz. If this is not the case, there might be two of these Clementi fortepianos in Portugal, but I consider that to be unlikely. The exterior of the Queluz’ Clementi is in fact very similar to nr. 2 on Ms. Novak’s list (page 73): Serial no. 544, (Queluz’, serial no. could not be deciphered). Date 1801-1802. Compass 5½ octave, FF-c’’’’. Length 221 cm. Case ‘Sheraton Style’, Sheraton being a very famous maker of veneered furniture during that period. No 3 on her list corresponds well to the length of the ‘Queluz’ i.e. 2.254m, making it improbable that the instrument was built after 1805. Clementi had his shop in London; we do not know if he liked the name of the street: it was called Cheapside. Muzio Clementi was a composer turned entrepreneur; we may safely assume that he was not himself sweating away at the instruments. To quote Clinkscale: ’An Italian, he came to England as a result of his having been sold to an Englishman, Peter Beckford. He moved to London in 1774 where he gave a series of successful concerts. He achieved great fame as a concert pianist, composer and teacher in Britain and on the continent. In 1798, Clementi, together with a group of partners took over the firm of Longman and Broderip…….which in 1822 when Frederic Collard joined the firm became known as Clementi, Collard and Collard till Clementi died in 1832.’ (Clinkscale, page 67). One of Clementi’s students and general dogsbody during his tours on the Continent was John Field, the first composer of Nocturnes. He was to be quite ruthlessly exploited by Clementi whose mercurial talents were not only limited to the Fortepiano business. London was, of course, not the only important place for the construction of Fortepianos, although the Square Piano Model was made in huge quantities for well-to-do citizens. But after all this was not where Mozart, Beethoven, and Schubert lived, worked and died. So there is a Viennese School of Fortepianomaking that did, in fact domineerthe 20th century reproduction of Fortepianos. Important names between 1790 and 1840: Stein, Walter, Streicher and Graf. Ludwig van Beethoven, possibly because of his progressive deafness, showed very little appreciation for the fortepiano and this may have something to do with its lack of status in many musical circles today as well as a belief many people have in technological ‘progress’. 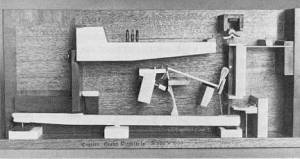 However, these were the composers’ tools and their compositions reflect this. The ‘newness’ and excitement of Clementis (who influenced Beethoven) and Beethovens compositions, is smothered whenon the modern piano, but highlighted by a performance on a period instrument. Our ears, used to the glib sounds of contemporary Steinways and Yamahas, can re-acquire the taste, and savour the exquisite sound of instruments like these. It is not until 1880, with cross-stringing firmly in place, that the modern piano as we know it basically emerges, with Steinway as its leader. (Crossstringing: strings do not run parallel to each other, blurring theclarity of the different registers) so there is a lot to savour. As an aside I’d like to mention that there is an incredibly beautiful Steinway from the eighteen sixties in the Yale Collection at New Haven (USA, Conservator Richard Rephann). But the need to accommodate an ever bigger audience forced all piano makers to step up the power of their instruments possibly at the expense of beauty and subtlety. It is ironic that the ‘fortepiano’ does not have a very powerful sound which the ‘piano’, on the other hand, does have, even the lowliest of its species. With a generally shrinking audience for classical music (especially chamber music) in present times, maybe Steinway could start to reproduce its own period instrument. Back to the eighteen hundreds now: the tonal difference between the English and the Vienna schools must of course be heard to be appreciated (see Discography), so we limit ourselves here to the construction, dealing with the action later. What are the pros and cons with respect to the differences in construction? If we compare the construction of an 1805 Walter to that of the Clementi-Broadwood school, the construction of the Walter is vastly superior. With the Walter, the braces of the case construction continuously interlock and the strings are attached to pins that live in a beam forming an integral part of the case. 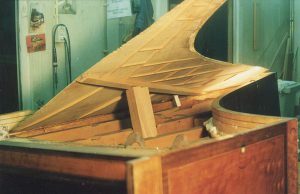 So, unfortunately, the ‘Queluz Clementi’ had severely warped under the tension of the strings, resulting in a cocked-up ‘cheek’ (the right-hand or treble side) that made it absolutely essential to take the instrument apart. To make this possible, the soundboard and pinblock (where the tuning pins are) had to be removed. The connection between the ‘cheek’ and the bentside had to be taken apart. This also involved removing a very ornate part of the case veneer, with the ‘Sheraton motifs’ on both these surfaces. ‘Removing’ here meant very carefully soaking out all these separate parts with the help of damp cloths. A very time consuming job, requiring a lot of patience. The next picture shows partner C. Kraan at work. 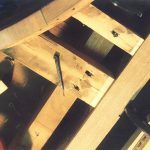 Once this was done, a very difficult decision had to be made: the pinblock had been warped to such an extent that we deemed it impossible to get it back into its original shape with the certainty that it would stay flat. 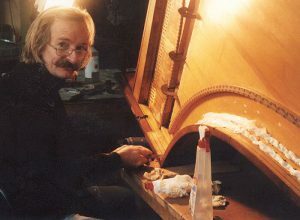 We are very grateful to Christopher Clarke one of the ‘grand old men’ (except that he isn’t very old) of fortepiano making and restoring, that he was willing to help us out with his advice, this decision being the most difficult one to take. So the pinblock was replaced with a copy: the same material (oak, and the same direction for the grain of the wood. The same measurements: if you realise that the standard pinblock of an 18th-century French harpsichord has a thickness of 5 cm and that this one was only 3.5 cm thick , you can imagine why we would have loved to keep it a little thicker. But the position of the action within the instrument made this absolutely impossible. The pinblock needs to be tapered, otherwise the hammershank would bump into the pinblock on its way to the string, as the picture shows. (The distance between the hammer rail with the pistolgrip form and the pinblock is only a few mm in the Clementi.). Making a new pinblock had the advantage that the original tuning pins could be used again. 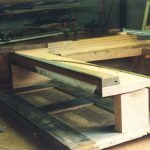 The rest of the instrument was straightened out with the help of clamps, this made the internal braces of the instrument too short. The braces are made of pine. The resulting gaps were filled out with the same type of wood.